One of the defining aspects of a corrupt regime is the blurring of the border between the public and private spheres, between the sphere of government aimed at the public good, and the sphere of private entrepreneurship aimed at making profit. Corruption is precisely when funds and goods meant for the public are used for private gain, or when private interests influence public policy. When these private interests fully take over the governmental apparatus and are, moreover, sponsored by criminal activities, we are speaking of state capture. A concrete example of the blurring of private and public spheres, or rather, the capture of the public sphere by private interests, are the grand architecture projects undertaken by the government of Prime Minister Edi Rama and Mayor of Tirana Erion Veliaj, aimed at completely transforming the historical center of Tirana while also laundering massive amounts of criminal money. The logic is always the same: in order to make sure that no public procurement of any aspect of the project needs to take place, the property on which the project is built, and the funds that are needed to finance it, are withdrawn from the public fund. For example, in the case of the National Qemal Stafa Stadium, the government moved the entire public property into a private entity called Qendra Sportive Kuq e Zi sha, a so-called public–private partnership between the Ministry of Culture and the Albanian Football Association (FShF). As this is a private entity, the entire procurement of the construction and design of the project was shielded from public scrutiny. Of course, this works well with the architect of the project, Marco Casamonti, who has been convicted for corruptionin his native Italy. In the case of the National Theater, the government drafted a “Special Law,” which would grant construction company Fusha shpk the exclusive rights to build on public land owned by the Tirana municipality without any form of competition. Although the law was amended after criticism of the European Commission, and the amended law that did eventually pass Parliament was never implemented, the rhetoric around the project clearly shows how public and private interests are no longer distinguishable. Prime Minister Edi Rama himself publicly announced the National Theater project of Danish architect Bjarke Ingels, suggesting this project was a public initiative of the government. Indeed, Bjarke Ingels himself claimed that he had won a public “competition,” which, of course, had never been held. When asked about this competition, the company subsequently claimed it was bound by a non-disclosure agreement with its client, the Municipality of Tirana, while on its website, it mentions private contractor Fusha shpk as its only client. So what is it? 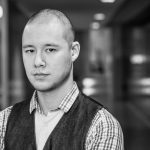 Public project with international competition? Public project with the municipality of Tirana? Or private project with Fusha shpk? The answer is of course: all of them. The national and local government held by the Socialist Party are only distinguishable from a private enterprise in name. The most recent example of this merger of public and private spheres is the renovation of the Pyramid in the center in Tirana. The first step, taken in April 2016, was to remove the Pyramid from the historical center of Tirana and thus take away its protection as monument. In December 2016, the government moved the Pyramid and the land around from national to municipal property of Tirana. 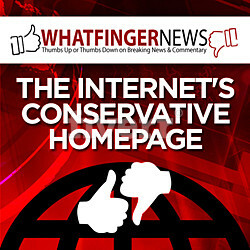 Because of this different status, there would be less oversight. A month later, in January 2017, Dutch MVRDV architect Winy Maas comes to Pyramid to give a “talk” about it. Note that during his first election campaign, Veliaj publicly protested against a previous (and failed) project of MVRDV, Tirana Rocks. 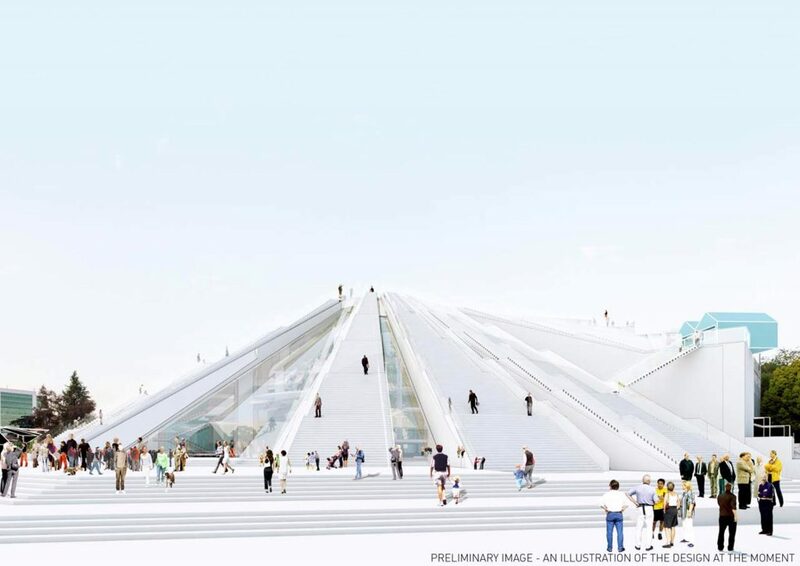 In June 2018, it was announced that MVRDV “got” the tender to reconstruct the Pyramid without any public competition or tender. Today, opposition published two screenshots from the MVRDV website. 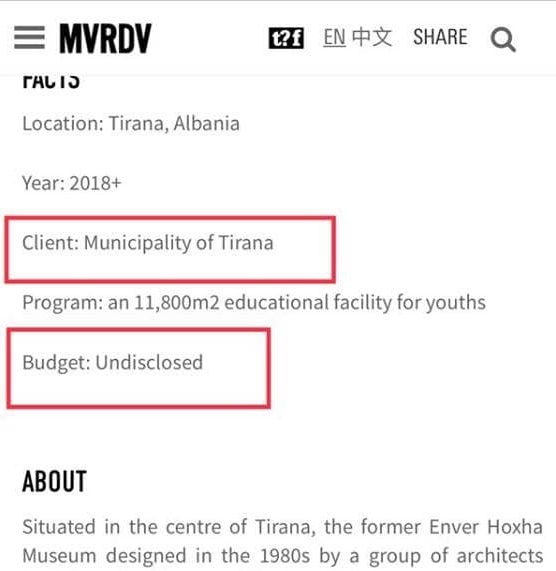 The first one shows that the Pyramid project was a project for the Municipality of Tirana (i.e., a public project subject to public procurement legislation) for an “undisclosed amount.” This is obviously in violation of the law, as these numbers are supposed to be public. The solution to this problem was by changing the client into the American–Albanian Development Fund (AADF), a private fund not subject to public procurement or transparency legislation, while completely erasing any reference to costs. This is how the project now appears on the MVRDV website, and is the same trick performed by Bjarke Ingels (changing the client from Municipality of Tirana to Fusha shpk). In all three projects we see exactly the same logic: moving public property away into private entities which are nevertheless under the control of those in power to avoid financial accountability. And all of this is course facilitated by “starchitects” who lend their fame and prestige to hide financial crimes of enormous magnitude.